A legal system that can confer rights but not ensure that they can be enjoyed is a cruel hoax. Thinkers are rare, but stinkers abound in the legal profession. Consider the sentence, Ours is a nation of poems. Do you have any idea of what it means? Or the sentence, Ours is a nation of clichés. Or the sentence, Ours is a nation of aphorisms. These sentences can be likened to Rorschach inkblots. People can ascribe meanings to them but no one can possibly know if the ascribed meanings are in any way similar to those I had in mind when the sentences were written. Every combination of English words does not produce a meaningful sentence. So what about, Ours is a nation of laws? Its form is exactly like the form of the previous three. Does it have meaning? Some lawyers, including President Obama, believe it does. They also believe it says something about America that distinguishes this country from others. Yet it might not have any meaning at all. Wikipedia puts it this way: “The rule of law is the legal principle that law should govern a nation, as opposed to being governed by arbitrary decisions of individual government officials.” But does America exemplify this normative principle? Certainly not in any clear way. First of all, nothing definitive can be concluded from how a law is enacted. Sure, monarchs can issue very arbitrary laws. So can legislators. A law’s definitive characteristic is whether or not it is just or fair or morally right. A law promulgated by a group (a legislature or a court) that is none of these is not an appropriate rule in any society, autocratic or democratic. Secondly, the laws being promulgated by our legislators and judges are clearly ideologically motivated. So is the opposition to them, and those whose objections to any case or enacted law are not likely to willingly obey it. Therein lies the foundation for enduring conflict. The legal system in America came into being in a haphazard fashion in England in the seventeenth and eighteenth centuries. England at the time was an absolutist monarchy. The system of law that came into being is called the common law. It was brought to this country by the colonists in a pushcart age. Pushcarts have not endured but the common law has. It has no affinity to democratic principles whatsoever. The federal courts are not staffed by elected officials. They are appointed by ideological politicians and they usually serve for life. When the Supreme Court decides a case, it cannot be challenged. No recourse exists except Constitutional amendment. 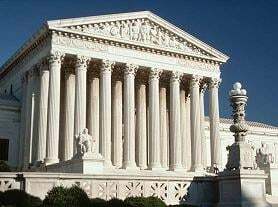 In addition to the Supreme Court, there are twelve circuit courts, which introduces a great deal of arbitrariness into the system. For instance, if a law is declared unconstitutional in one circuit, say the ninth, the law is only unconstitutional in the states in that circuit, not in the rest of the country. So the result is a law that is both constitutional and unconstitutional at the same time. Does that describe a country ruled by law rather than men? If so, what law rules it? But look at what is revealed if the situation is embellished slightly. Suppose that the constitutionality of the same law is brought before two circuit courts and they issue diametrically opposed opinions. How is that possible? The ninth and fifth circuits do it frequently. That can only happen when the justices on these courts base their opinions on different “rules.” That possibility exists because the choice of rules is done arbitrarily. No list of rules for justices to choose from exists. What they do is search through opinions issued by courts previously and pick those that serve their purposes. The practice of basing opinions on such rules is derived from a common law principle called stare decisis which in Latin means let the decision stand. The principle was used in an attempt to ensure the consistency of the body of common law. In America, the expression has a different meaning—relate each opinion to a previous opinion. The Latin expression has come to mean this because from time to time, opinions have been motivated by different ideologies. After more than two hundred years of opinions, justices can select whatever rule that conforms to their own ideologies from the many that have been held by justices in the past. The process is totally arbitrary and subjective. Does it describe a nation being ruled by law or a nation being ruled by men? There is but one possible answer. Perhaps since its inception but certainly since 1803 when Justice John Marshall issued the decision in Marbury v. Madison, this country has been a sixteenth century judicial oligarchy masquerading as an enlightenment democracy, and the oligarchy has led this nation deeper and deeper into a state of decadence. Despite the founding fathers having warned against it, America is now an ideologically fractured nation. The number of its factions is too large to easily count. More than a score of religious factions exist, each differing from the others in some ideological respect. Political factions exist as do legal, economic, social, and commercial factions. I personally have no hope of even mentioning them all. Most have ideological objections to some opinions issued by the Supreme Court. Various lists of “the Worst Decisions” are easily found. Ideologies clash even in the courts, and those with ideologically motivated objections to a decision are not likely to try to make it easy for those favored by the decision to benefit from it. After the Civil War, a number of amendments to the Constitution were ratified that gave freedom, citizenship, and all the rights available to whites to former slaves. Those in the defeated states of the Confederacy who continued to hold a master-slave ideology set out to prevent the former slaves from enjoying those rights. Jim Crow, his siblings, and their children traveled far and wide inducing legislators to enact legislation for that purpose. The concept of Jim Crow legislation was born. Laws requiring separate facilities for each race, poll taxes, employment regulations, and many others were enacted to make it difficult for former slaves to attain their rightful places in society. That practice endures. The Crow family is very large. More than a century has passed and Lincoln’s house divided is still divided, and the politicians and courts have done very little to unite it. The Supreme Court has even recently exacerbated the divide in its decision of Shelby County v. Holder (2013) by again making it possible to question the voting rights of many individuals who have voted for decades. Jim Crow’s children are alive and well! Enacting Constitutional Amendments did not resolve the issue. It continues to this day. In 1954, the Supreme Court ruled that the segregation of the public schools is unconstitutional. Those in America with a racial purity ideology began enacting Jim Crow legislation meant to keep the races separate. The long-held principle of neighborhood schools was abandoned and the establishment of alternative schools was encouraged. Done under the guise of educational reform, integration was effectively blocked and the segregation of school children is greater today than in 1954. Although school reform is still a topic of discussion in educational and political circles, the quality of education has not improved markedly. Jim Crow’s children have won again! For sixty years, they have frustrated the Court’s decision, and the conflict continues. In 1973 a decision in Roe v. Wade gave women the right to abortion under certain conditions. Roe v. Wade challenged the constitutionality of Texas’ abortion laws, but even today, women in Texas cannot easily acquire an abortion. The Texas legislature has enacted such stringent requirements for clinics that offering abortions must meet that few such clinics exist. Forty years have passed and the women of Texas cannot access a constitutional right to which they are entitled. Oh, that Jim Crow family! Despite the ruling, the dispute between pro-life and pro-choice groups continues. The Court decided a case but did not resolve the issue. The upshot is that trying to use the law to resolve ideologically motivated disputes can be likened to trying to smooth rough waters by using sandpaper. The sanding only irritates the antagonists. Yet a legal system that can confer rights but not ensure that those rights can be enjoyed is a cruel hoax. No black person in this country is a full-fledged citizen, not even Clarence Thomas who sits on the bench of the highest court. No woman in Texas or any person anywhere whose right to vote can be questioned is a full-fledged citizen of this country either. Numerous such groups of quasi-citizens exist and the courts stand by seemingly helplessly. Members of the judiciary and perhaps the entire legal profession don’t care if the system’s results are just or unjust. Their only concern is implementing a seventeenth century legal ideology without subjecting it to critical scrutiny. They are caught is a web of thoughtless conventionality. Chief Justice John Marshall in Marbury v. Madison established the standard for the operation of the courts in America. He not only made the Constitution into whatever the Court wants it to be (“It is emphatically the province and duty of the judicial department to say what the law is”) and he refused to grant Marbury his commission that even the Court deemed he was entitled to. Most people would consider that some weird kind of justice, even an injustice, but America’s courts have been practicing it for over two centuries. Why did Marshall do it? Because he wanted to. Why do the courts still do it. Because the justices who sit on their benches want to. It’s as simple as that. Is this country ruled by law? Not by a longshot! It is not the country that Americans pledge their allegiance to. That nation is one nation, indivisible, with liberty and justice for all. Is it a myth? If so, shouldn’t those who are called upon to shed their lives for it know?